It has been a major roller coaster of a month. So many wonderful things happening yet all of it clouded by the simple fact that Hannah should have been turning 5 a week or so ago. We had Hannah’s 2nd annual “Little Miss Hannah’s Rainbows in the Wind” event, and the turnout we had was phenomenal. Not only did we raise more money that last July’s event, but we had such an amazing group of organizations and companies who donated their time, energy, and resources to make this night special. From top Vegas children’s entertaining groups to our amazing DJ and photographer to over 2 dozen volunteers who came out just to help make our event run smooth! The outpouring of love and friendship that came to support us at this event … so many wonderful family, friends and colleagues including 4 of Hannah’s awesome nurses, a number of her therapists, and friends we have met in the 3 years we have lived in Las Vegas. (We should be getting pictures next week from the event – our photographer does amazing work). The morning after the event, we surprised Ethan and Abby with a trip to visit Hannah’s favorite characters ever – we went to Disneyland! We had a fantastic time as a family, letting loose and just enjoying ourselves. We did two special things that I had wanted to do at Disneyland to celebrate Hannah’s birthday – we did a balloon release from the park to her, and we had brought her Minnie Mouse with us to take our family picture. The kids had so much fun, we hope to go each year to celebrate Hannah. 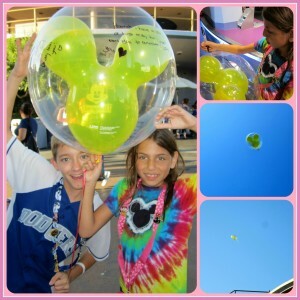 We purchased a yellow Mickey balloon, and we each wrote a special message to Hannah on it. The kids released it right in the center of the park! We needed to get away and decompress from everything – the stress from the event, the overwhelming sadness we were all starting to feel as her birthday approached, to regroup as a family. At Disney, we all talked about Hannah quite a bit (especially Ethan, which was unusual since he is usually quiet), and it felt like she was there with us many times. Today, we did a delivery to another Little Miss Hannah family. It was the same little therapy chair that we wanted so desperately to get for Hannah. We actually were given a loaner for a while for Hannah, but we never could afford it because it wasn’t medically necessary. But today I got to give this chair to a special 3-year-old little girl who I just instantly fell in love with. She reminded me of Hannah at times, especially how she was instantly hooked on her favorite television show! We (my hubby, kids and I) all walked away from this delivery today feeling absolutely wonderful. Ethan was proud because he was the one who assembled the chair so we could deliver it ready-to-go (He has become our master builder!). We were able to give this little girl something we were never able to give Hannah, and by doing that, we all felt like Hannah was right there with us. I know this little girl will get so much use out of this chair and tray set, and because of my Hannah, we did what we set out to do — enhance the quality of life for kids like Hannah in our community. I read something tonight that completely nails it on the head of why I am so passionate about what we do with our Little Miss Hannah Foundation. It is because THIS is how I am able to continue to be a mom to Hannah, to parent Hannah. This is how I get to do things for her even though she isn’t here anymore. 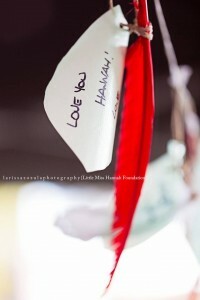 Hannah lives on in the hearts of so many people, even those who didn’t know her when she was here with us. I am proud of my children, all three of my children. Ethan and Abby’s lives are immersed with the concept of giving, volunteering, and taking care of special children. I truly believe that this lifestyle we live along with their schooling, sports, friends, and other activities will really get them prepared for their futures. And I am most proud of Hannah – for being who she was, fighting as hard as she did, and for making me a much better person than I was just 5 short years ago. I think back to the eulogy I gave at her funeral, and I hope she is as proud of me as I try to live up to my promise to her.